This silent sci-fi epic, often labeled the first feature-length treatment of space exploration, preceded Fritz Lang’s “Metropolis” (1927) by three years, but remains relatively hidden by the latter film’s shadow. The movie follows Los, a scientist who builds a rocket and flies to Mars. Meanwhile, Aelita has already fallen in love with him via telescope voyeurism (pioneering the classic device of 80’s teen comedies) and the two conspire to lead a worker’s revolution on Mars. However, Aelita *cough*Lenin*cough* betrays her collaborators and makes a bid for dictatorship. “Aelita” doesn’t particularly stand up modern science or contemporary cinema, but one can still squeeze plenty of entertainment value from the celluloid. The overt propaganda and earnest pseudo-science make the film funny enough to serve as B-movie kitsch. 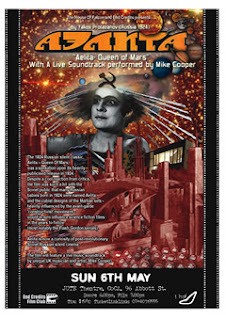 The constructivist sets are impractical art deco indulgences filled with swooping curves and oblique angles and only barely upstaged by the insanely inspired costumes (check out Aelita’s “crown” in the poster art above for the tiniest taste). The sweeping scope, high budget and imaginative vision even make the second half of the film passable as vintage adventure fodder. The film was a popular success in its day. Director Yakov Protazanov enjoyed the type of mass appeal never really achieved by the more intellectually rigorous Eisenstein and Pudovkin, though history has since reversed their fame. Today, it has a nostalgia value that will endear it to fans of “Flash Gordon,” but it lacks the weight and nuance to stave off obsolescence. Oh, and like all Soviet films, it is too slow and too long. Andrei Tarkovsky adapted Stanislaw Lem’s celebrated novel into one of his best known and highest regarded films. It features Kris Kelvin, a psychologists assigned to evaluate the situation on a space-station orbiting the liquid planet Solaris. He finds the spaceport to be in a state of growing disrepair, with the skeleton crew acting reclusive and evasive. Kris soon learns the reason when he wakes up next to his wife, a woman who committed suicide nearly a decade earlier. More than an apparition, the creature appears to be some misguided attempt by the planet to communicate with his mind. Kris struggles feebly to come to grips with a new reality for which humanity is utterly unprepared. Tarkovsky’s film was one of the first to link the unfathomable mysteries of space with those in the human mind. His film slow-brews a cerebral concoction of emotional intimacy and identity with the frightening potentials of science and technology. The film is equally fascinating rather the viewer is trying to read Kris’s inscrutable face or attempting to unravel the mystery of Solaris’s abstract sentience. Few films before or since have so devastatingly tapped into our fear of the unknown. However, like all Soviet films, it is too slow and too long (even compared to the other films in this Iceberg Arena). The extended prologue and the ending twist are both muddled meditations that stretch out intolerably. Fans of the director’s work should have very little problem, since his pacing is no slower than usual, but newcomers should consider themselves warned. In many ways, Soderbergh’s underrated remake is a more cohesive, balanced and digestible work. Personally, I prefer Tarkovsky’s other cult sci-fi film, “Stalker” (1975), but I chose not to include it in this contest because it would have made the competition unfair. 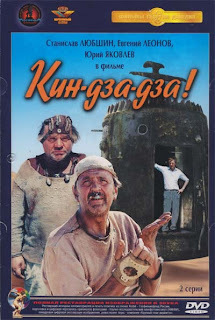 “Kin-Dza-Dza” is a cult film that mixes absurdist and satiric comedy with harsh-environment themed science-fiction. A construction foreman (Vladimir) is on his way to buy noodles for dinner when he is stopped by a college student (Gedevan) who is seeking help for a raving hobo. The tramp claims to be an interstellar traveler trying to use a small piece of junk to teleport to his homeworld. While condescendingly playing along, the two terrestrials find themselves transported to the desert wasteland planet of Pluk. Playing like a Soviet “Hitchhiker’s Guide to the Galaxy” (closer to the low-fi charm of the book, not the glossy movie), the film has fun jerking its fish-out-of-water protagonists through a series of weird adventures. Much of the humor comes from the oddly-conceived alien society found on Pluk: the indigenous race of mercenary telepaths has a ridiculously strict class structure and, fortunately for the humans, a currency based around matchsticks. They have about a dozen native words (including one for nose-bells), but their language mostly consists of “koo” which tends to serve all purposes. The unique sense of oddball humor is probably more interesting for most viewers than the actual genre trappings and will make or break the experience. Director Georgi Daneliya borrows somewhat haphazardly from any sci-fi concept that crosses his mind and creates a messy, low-continuity plot that moves in unpredictable bursts, but manages to maintain a consistent voice and goofy appeal. The film has never been released in the US and there are no plans to do so, perhaps because the film, like all Soviet films, it is too slow and too long. A very decent fansub can be found on Google video here. 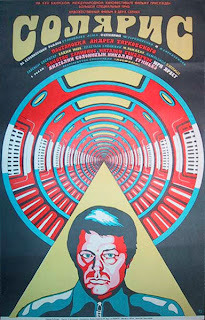 “Solaris,” along with its American equivalent, “2001: A Space Odyssey,” are cerebral exercises that exceed their literary antecedents, defying the maxim that “the book is always better.” “2001” makes a decent litmus test for whether you will like the Soviet classic and should give you a sense of its art-house tone. Enough praise cannot be given to Soderbergh's remake. Especially on the soundtrack front. I am constantly surprised by hearing the score in unexpected places... like Nike ads. And I feel that Clooney's general acting style was better suited to Kelvin than it was to, oh, say, a certain post-WWII reporter. And I'm all for new color palettes in sci-fi.